A common feature of managed woods, and an aspect that has made them popular among farmers, woodlot owners and maple producers is the potential to harvest logs and produce boards. Managing your woods for lumber involves consideration of the logs for lumber, but also cultivating the woods to ensure future productivity and healthy trees. If the woods are mined rather than tended, future options and opportunities may be eliminated. An Internet search for “lumber from local woodlots” will yield access to a free publication on the ForestConnect publications page that addresses types of trees and wood properties, measuring trees, harvesting plans, and matching lumber supply with building needs. In this article I will share information on manipulating the woods, harvesting, and utilization. Additional resources are listed at the end of the article. The starting point for harvesting trees is to have a clear and full understanding of your ownership objectives. Obtaining lumber is one objectives, but you may also be interested in maple sap and syrup, aesthetics, trails, wildlife habitat and more. A written management plan will help you obtain these varied objectives. If a harvest removes trees that are large enough to provide lumber, the owner will benefit from involving a forester. The forester can write a plan for the owner, and can also mark trees that will be removed in the harvest. The forester can identify trails the owner can use for skidding the logs, or the forester can administer a commercial sale if the logs are sold. If the harvest is commercial, it is in the owner’s interest to sell the standing trees in a lump sum sale. It is rarely advantageous for an owner to harvest trees and then sell the logs roadside. The owner might also designate specific trees to retain as logs for personal use, or buy back some logs from the logger. Discuss these options before signing a timber harvest contract. The strategy for harvesting will fall into one of two broad categories. One category, called “intermediate treatments” is intended to improve and enhance the existing woods, or residual trees left behind. Intermediate treatments are analogous to weeding your garden. The other strategy is a “regeneration treatment” and is intended to grow the next forest. Based on the condition of your woods and the specifics of your objectives, your forester can develop a harvesting plan to suit your needs. A harvest is a good opportunity to adjust the composition, the mixture of species, in your woods. For owners with a high percentage of white or green ash, harvesting will allow you to utilize some ash and concentrate growth on other desirable species. Harvesting should not attempt to eliminate ash, but the harvest may diminish its abundance. Ideally this process happens before the emerald ash borer (EAB) is close, and you can avoid crisis management as part of forest management. The ForestConnect site (see resources below) has a fact sheet on silviculture for invasive insects. Owners and their forester might plan for several sequential but small-scale harvests the owner conducts every few years to provide lumber at the timing and quantity you can manage while avoiding an abrupt change in the forest. Except in special circumstances such as created by the emerald ash borer or hemlock woolly adelgid, harvesting should generally maintain the mixture of species that have naturally established on the site. Of course there will be changes as forest succession proceeds, but the species naturally established are likely (but not always) matched to the soils and will perform well. Thinning, an intermediate treatment, should remove stems that allow the best trees to grow until the final harvest. In this picture, two oak stems are marked for harvest and concentrate growth on the better quality stems. Both marked trees could produce lumber. A temptation when harvesting trees for use as lumber is to cut the biggest and straightest trees and leave the rest. This harvesting strategy is effectively a diameter-limit cut and also known as a high-grade. The removal of only the biggest trees and those most easily turned into boards can result in a degraded woodlot with predominately trees of low value, poor form, undesired species, and slow growth. Owners who heat with wood, or sell firewood, have distinct advantages in being able to utilize the cull trees. The smaller trees are most often similarly aged “runts”, and are not younger trees that need to be released. A forester can help you select trees that ensure you obtain the logs you need for lumber, cull the woods, and leave a residual forest (the trees that remain after harvesting) that will be healthy and productive. Either the owner or someone contracted by the owner can harvest trees for use as logs. Harvesting trees, regardless of size is potentially dangerous to the owner and can damage the residual trees. 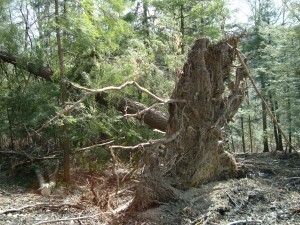 Although this tree would produce lumber, cutting the tree would include the double hazard of the stem under tension and the likely re-settling of the root ball. Some trees are better left uncut. The person felling the trees should have completed Game of Logging (GOL) training levels I and II, and hopefully level III. Game of Logging is an educational program that originated for loggers to increase productivity and safety. It has been adapted for and found great favor with woodlot owners. The GOL teaches owners how to use PPE (personal protective equipment) and also PPB (personal protective behavior). For someone with adequate training, felling a tree can be straightforward. However,trees under tension (AKA spring poles), root balls of windthrown trees that may tip back into their hole, and hung trees are relatively common and warrant special consideration to avoid personal injury or death. 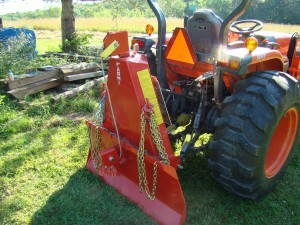 Special attachments for ATV and tractors, shown here with a winch, increase safety and productivity. 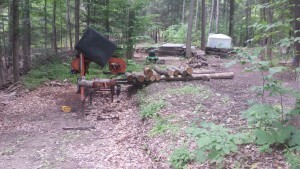 Care is needed if these types of machines are used for small scale logging. is usually higher than for skidders, so special care must be used to avoid operating on side-slopes where the machine might roll sideways. A variety of 3-point hitch skidding winches are available for tractors and arches are available for ATVs. Look for a training course and use considerable caution; every year there are tragic accidents that involve woodlot owners, maple producers and farmers. A common source of damage to residual trees is when an owner or someone they contract uses equipment that isn’t quite adequate to do the job. The wrong tool for the job seldom works well, and often results in increased risk of damage or injury. The time of year trees are harvested can influence the need for additional actions. For ash, summer harvesting can result in significant lengthwise splitting of logs to the point they cannot be sawn into boards. The splitting of ash logs can be reduced or eliminated by cool weather logging from late fall through early spring (before the ground thaws). The added advantage of winter logging is that dragging logs on frozen and snow-covered ground will reduce dirt and rock in the bark that dulls chain saws and band saw blades. In the spring, roughly late March through mid to late June, the bark of trees is “loose” and more likely to peel away in large sections if bumped by a tractor or skidder. Also, soft and wet ground in the spring can result in significant rutting. 1. Numerous publications are available via www.ForestConnect.com A social network is also accessible for owners at www.CornellForestConnect.ning.com and includes an events page, blogs, questions and answers, and a place to post pictures of what you are doing in your woods. 2. Some of the manufacturers of portable bandsaw mills maintain lists of sawyers. Look on the Internet for sawyers in your area from company webpages for Woodmizer, Baker, Timberking, or Norwood. 3. 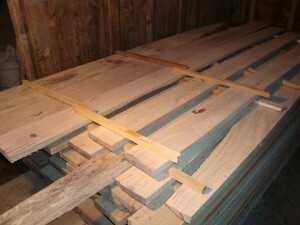 The discussion boards at www.forestryforum.com have numerous topics related to small scale harvesting, sawmill operation, lumber handling and timber framing. Support for ForestConnect is provided by the Cornell University College of Agriculture and Life Sciences and USDA NIFA. The grade of logs, an assessment of quality, may change depending on the duration and conditions of their storage before milling. Hardwood logs of light color (e.g., maple) cut during the summer will quickly start to lose grade because microorganisms will spread in the wood and change its color. In this case, the change in grade is based on wood color and not wood structure. For some owners the change in color is desirable and adds aesthetic complexity to an otherwise ordinary board. The volume of each log may decline as they lose moisture and shrink. Logs may also check, split on the ends, which can reduce the usable length of the logs. Control of these concerns is accomplished by processing hardwood logs quickly, usually within a month, keeping the logs under a sprinkler system as done in many industrial log yards, or by coating the ends of the logs with an end-grain sealant. Felled trees should be bucked into log lengths that optimize straightness and reduce taper. 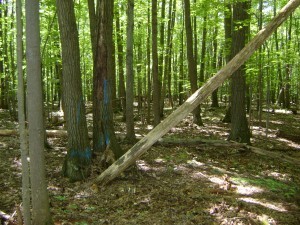 Skidding shorter logs typically causes less damage to residual trees than skidding long logs. Regarding taper, there might be a straight 16 foot log, but the log’s diameter may change by 2 to 4 inches or more and cause a significant loss of lumber in slab wood. By convention, logs are usually cut 4 to 6 inches longer than the final product to allow for end trimming after the boards have dried. Logs can be sawn immediately. There is usually no advantage to wait, although some logs may sit for several weeks or months before being sawn. Logs should be stacked on a pair of sacrificial logs to allow for air circulation, reduce dirt in the logs and increase the ease of movement of the logs. Adequate space for storage of logs after harvest is necessary. A commercial sale will require a landing that can be accessed by a log truck. If logs will be milled on-site, plan for the location of the portable sawmill, moving logs onto the mill, access with trucks or wagons to move lumber, and how slab wood and sawdust will be disposed. Advance planning will allow arranging logs in a manner to more easily load the sawmill. Creating a cut bank or using a gentle slope makes easy work of loading logs if the sawmill lack hydraulics. Select a custom sawyer who has experience. An experienced sawyer can help you fully prepare for the sawing and storage of lumber. Use your local personal networks, or resources listed below to find a sawyer. Consult with the sawyer before harvesting to make sure any special needs are known, how the logs should be arranged, and to ensure the sawyer is available. Lumber should be stickered immediately after sawing, ideally as the boards come off the mill. In door storage, as illustrated, is ideal if space is available. of stickered lumber should be elevated on a sturdy foundation of block about 12” to 16” above ground. Usually, boards of different thickness and length will be stacked in different piles. Position those stickers near the ends of the boards, as close to the end as possible, to reduce end checking. Cover the piles of lumber with old metal roofing or plywood. Plastic coverings tend to collect water and may not allow adequate air flow. The utility of a species will depend on the project. In many utilitarian projects, the lumber that is available is the lumber that is used. One consideration is the strength of the wood especially for structural or load bearing uses. Internet resources are available to guide the type, quantity and dimension of lumber used for rafters and joists. Your local building code officer may also have resources. A second consideration is durability. If wood is kept dry, the board will resist decay. Other than rot resistant wood such as black locust, white cedar, white oak or larch, wood exposed to the elements will benefit from a preservative. Several preservative treatments are commercially available and owners should consult online reviews and with local vendors and builders for suggestions on brands. I was wondering how the resawing was going. I appreciate all the work you put into this tutorial, I hope to someday put it to use. Thanks!